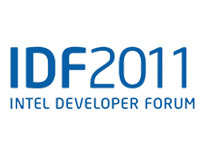 With the 3rd day of the Intel Developer Forum 2011 coming along, the official recorded keynote addresses by Paul Otellini and Mooly Eden have been made available. If interested, you can check out the nearly two hours of material below. IDF 2011 is slowly coming to a close, but the company is hoping that its motto of "The Sky's Not the Limit. It's the Baseline" lives on. Of course, not everybody had the opportunity to be in San Francisco for the event, and as such Intel is now making the keynote addresses available online. The recordings of CEO Paul Otellini and GM of the PC Division Mooly Eden have been added to Intel's own website, but we've also embedded them below for your perusal. The forum was started by Intel CEO Paul Otellini and his 44-minute keynote, titled "The Evolution of Computing: Looking Ahead". The address was a general outlook on Intel's future development, and topics ranged from the new 3D Tri-Gate transistors and 22nm manufacturing to Sandy Bridge's successor (Ivy Bridge) and the upcoming Haswell chips. Further details can be found in our summary of the keynote, but if you've got 45 minutes to spare then we definitely recommend giving the video a spin. On the 2nd day of IDF 2011, General Manager of Intel's PC Client Group, Mooly Eden, presented a talk titled "The PC Transformation". In it, the GM talks about the new class of Ultrabook notebooks, Thunderbolt, Windows 8 and the new processor generations for 2012 and 2013. Of course, a picture (or in this case a video) is always worth a thousand words, and we'll let Mr. Eden do the talking.